Creating value and efficiency is at the heart of a comprehensive approach to solutions for the healthcare and cleaning industry. The Geerpres® system includes quality, warrantied products, hardware and advanced supplies paired with a leading EVS software management program. The result: EVS teams and patients will benefit by lowering operating costs, improving HCAHPS scores, and eliminating HAIs. Geerpres® has a history of providing innovative cleaning products and supplies. Our high-quality, stainless steel cleaning products offer superior antimicrobial properties required in the healthcare environment. In business for over 80 years, Geerpres® EVS carts, steel wringers, and seamless buckets have been the industry standard in environmental services including hospitals, cleanroom/critical environment, food service, education, military and more. 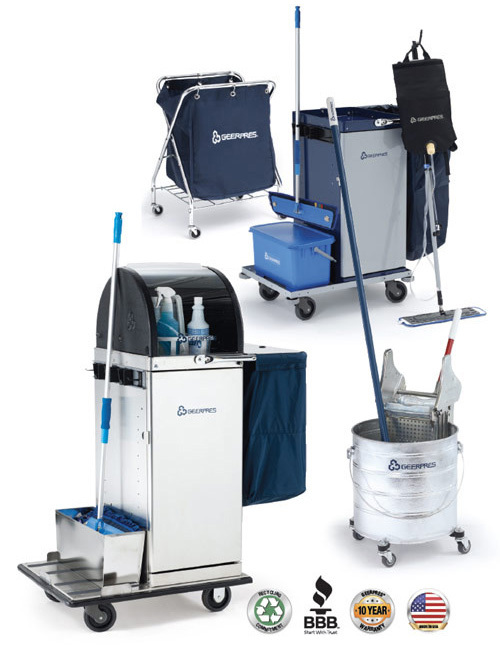 Today, Geerpres® has expanded to include patented self-dispensing microfiber applicators, disposable mops and wipes that virtually eliminate cross- contamination concerns, and a durable powder-coated EVS cart line. Geerpres® offers a unique EVS personnel and workflow management software package, which provides real-time visibility on team member location, workload status/instructions, audit/compliance records and reporting tools.